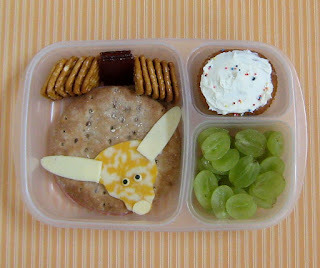 BentoLunch.net - What's for lunch at our house: Hook'Em Horns - Longhorn Bento for Ben! Hook'Em Horns - Longhorn Bento for Ben! It's almost football season, so Mr. Ben needed a Longhorn style bento to get in the mood! Thankfully, I do have a Longhorn cookie cutter, but had to take a few liberties with the horns since the full version didn't fit into any of my boxes. Ben has a ham and garlic/herb cream cheese sandwich on multigrain rounds, topped with a Longhorn! He has a few pretzels, some all-natural organic fruit leather, grapes, and a pumpkin spice cupcake that I made because I was totally craving something pumpkin! The cupcakes are from this recipe, just in cupcake format. It's packed in a Easy Lunchbox for the space for the cutout (ELB are also available on Amazon for ease of shopping). What a cute longhorn! I looove the pumpkin cake recipe! I made it in to cupcakes last year and they were a huge hit! Love your Longhorn! Hook 'em Horns!